Jellyfish appear harmless. Despite an occasional tale about swimmers being stung by jellyfish, Hollywood movies always feature shark attacks. No National Geographic special has featured cameramen being lowered into the sea in heavy steel cages to film voracious jellyfish. The Discovery Channel hosts a Shark Week each year but lacks a Jellyfish Day or even a Jellyfish Hour. Nevertheless, a flotilla of jellyfish attacked the Turkey Point nuclear plant in Florida on September 3, 1984. They stormed the plant in such numbers and with such ferocity that they clogged the flow of cooling water to the plant’s main condensers. A metal screen designed to keep debris from being pumped into the plant was bent inward nearly two feet during the assault. Both of the nuclear reactors at Turkey Point had to be shut down. The clogged screens prevented the waste heat produced by the reactors from being dissipated to the environment. The reactors remained shut down for 11 days until Hurricane Diana swept the jellyfish back out to sea. It was neither the first nor the last time that jellyfish put a nuclear plant in a jam. A year earlier, the operators manually tripped the Unit 1 reactor at the St. Lucie nuclear plant in Florida due to jellyfish blocking the cooling water supply. A month before the September 3 attack, the operators manually tripped the Unit 2 reactor at St. Lucie when the jellyfish returned en masse. On September 18, 1993, the operators tripped the Unit 1 reactor at St. Lucie, again due to jellyfish intrusion. Two days later as the operators attempted to restore Unit 1 to full power, the jellyfish made another sneak attack. The operators had to trip the reactor again. On September 20, 1993, while making another attempt to restore the reactor to full power, the operators again had to trip the reactor because of the jellyfish. Jellyfish also caused the operators to reduce the power level of the Unit 1 reactor at the Calvert Cliffs nuclear plant in Maryland on July 7, 2006. 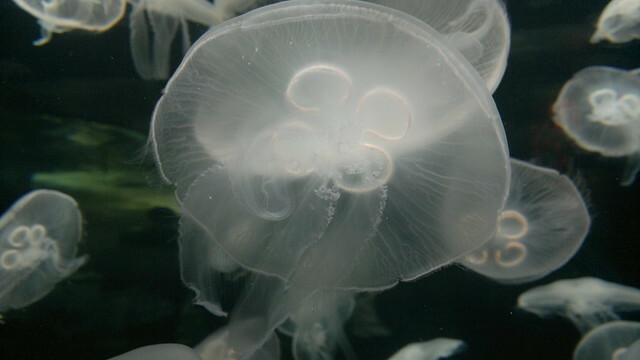 On October 21, 2008, Moon Jellyfish forced the operators to trip the Unit 2 reactor and reduce the power level of the Unit 1 reactor at the Diablo Canyon nuclear plant in California. The operators tripped the Unit 2 reactor at the Point Beach nuclear plant in Wisconsin on May 15, 2004. Workers lost sight of a diver performing underwater work at the intake structure where the plant draws water from the lake. As a precautionary measure, or as the first step in the recovery effort, the operators shut down the reactor. After the operators turned off the pumps at the intake structure, a second diver entered the water and was able to find the first diver and free his snagged air/communication line. No jellyfish were involved, but it shows that human swimmers can match what jellyfish can accomplish. Nuclear plants draw vast amounts of water from nearby lakes, rivers, and oceans. Large quantities of fish larvae and other aquatic wildlife in that water perish along the way. The jellyfish got some revenge. The toll paid by aquatic environments around nuclear plants is not insignificant and must be factored into the environmental assessments of nuclear plant operation. The aquatic environment can also take its toll on power plants, and that must also be factored in. Postscript – Don’t dive near the intake structures for nuclear power plants. You might get in the way of the next jellyfish swarm.